Can you think of a better way to celebrate the summer solstice than by hanging out with astronomers and taking a guided tour of our magnificent solar system? Didn't think so. 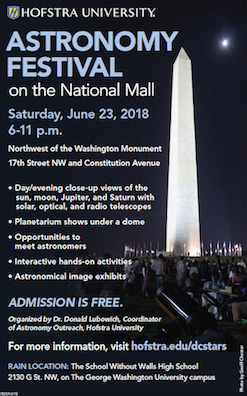 The longest day of the year will be commemorated with the 9th Annual Astronomy Festival on the National Mall (AFNM) on Saturday, June 23, 2018, from 6 to 11 pm.. The Washington D.C. event invites patrons to take in views of the city's historic monuments, and with the help of advanced telescopes and expert astronomers, in-depth views of our magnificent sky. With 20 telescopes set up at the free event, attendees can make optical, solar, and radio telescope observations of the Moon, Sun, Jupiter, and Saturn. Before dusk, a crew of local astronomers will help the public peer through filtered telescopes to observer sunspots, and get stellar views of the Moon, Jupiter and its moons, Saturn and its rings, and unique, glistening stars after sunset. 100 educators from 33 different astronomy clubs and science organizations will be strolling around the Mall to answer your astronomical questions, lead talks, conduct hands-on activities and demonstrations, and much more. And if that's still not enough excitement for you, the AFNM will also be featuring an outdoor planetarium show under a blow up dome. The AFNM, organized by the Coordinator of Astronomy Outreach at Hofstra University, Dr. Donald Lubowich, began in 2010 as part of Music and Astronomy Under the Stars, a NASA-funded program that brings astronomy events to outdoor concerts throughout the country.